Two new cestode species of the family Hymenolepididae Perrier, 1897 are described from birds of the order Passeriformes at Wondo Genet, Ethiopia. Passerilepis zimbebel n. sp., a parasite of Terpsiphone viridis (Müller) (Monarchidae), is distinguished from its most similar congeners by its diorchoid rostellar hooks with length 37–38 μm, its median ovary consisting of three compact lobes, its compact vitellarium and the variable position of the terminal genital ducts passing mostly dorsally to the poral osmoregulatory canals. Citrilolepis n. g. is erected as monotypic for C. citrili n. sp., a parasite of Crithagra citrinelloides (Rüpell) (Fringillidae). The new genus is distinguished from the remaining avian and mammalian genera of the family Hymenolepididae by the presence of numerous (18) rostellar hooks, unilateral sinistral genital pores, ventral osmoregulatory canals with transverse anastomoses, 3 (rarely 4, in c.10% of proglottides) testes in number with variable positions in the proglottis and the sac-like uterus not extending beyond the osmoregulatory canals. This article was registered in the Official Register of Zoological Nomenclature (ZooBank) as 51AF63BB-9A07-4C4C-B0E5-DB7D6C6726C2. This article was published as an Online First article on the online publication date shown on this page. The article should be cited by using the doi number. This is the Version of Record. We are grateful to Professor Abebe Getahun of the Addis Ababa University for his support in organisation of the field studies as well as to Mr Yeneneh Teka of the Ethiopian Wildlife Conservation Authority (EWCA) for issuing the necessary permits for field studies. Field work assistance was provided by Mr Girma Ayalew and Mr Teklebrhan Kidane (EWCA) as well as by Mr Henok Getachew. We are especially grateful to Dr Andrea Waeschenbach (London) for sharing unpublished sequence data and depositing them in GenBank. We used facilities developed at the Institute of Biodiversity and Ecosystem Research, Bulgarian Academy of Sciences, in the frames of the projects WETLANET (EC FP7, Programme CAPACITIES, Grant 229802) and CEBDER (National Science Fund of the Republic of Bulgaria, Grant DOO2–15/17.02.2009). This work was funded by the National Science Foundation of the USA, PBI grants DEB 0818696 and DEB 0818823 (to Janine N. Caira and Kirsten Jensen). All applicable institutional, national and international guidelines for the care and use of animals were followed. The field study was permitted by Memorandum of Understanding signed by the Director, Wildlife Utilization Directorate, EWCA, and the research team on 20th November 2012 in Addis Ababa. Canaris, A. G., & Gardner, S. L. (2003). Bibliography of helminth species described from African vertebrates 1800–1967. 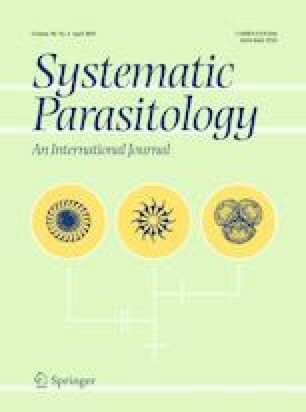 Faculty Publications from the Harold W. Manter Laboratory of Parasitology. http://digitalcommons.unl.edu/parasitologyfacpubs/3. Accessed 18 January 2019. Lepage, D. (2019). Avibase, the World Bird Database. http://avibase.bsc-eoc.org/. Accessed 4 January 2019.